The next time you think about rejiggering your investment portfolio to overweight some of the recent winners (or losers) consider this patchwork chart. There's no discernable pattern amongst different asset classes. Some experience worst-to-first reversals in a year or two, others meander in the middle for extended lengths of time. By holding a diversified portfolio and rebalancing it periodically back to its initial target, you're certain to own enough of tomorrow's absolute winners without being overallocated to tomorrow's absolute losers. 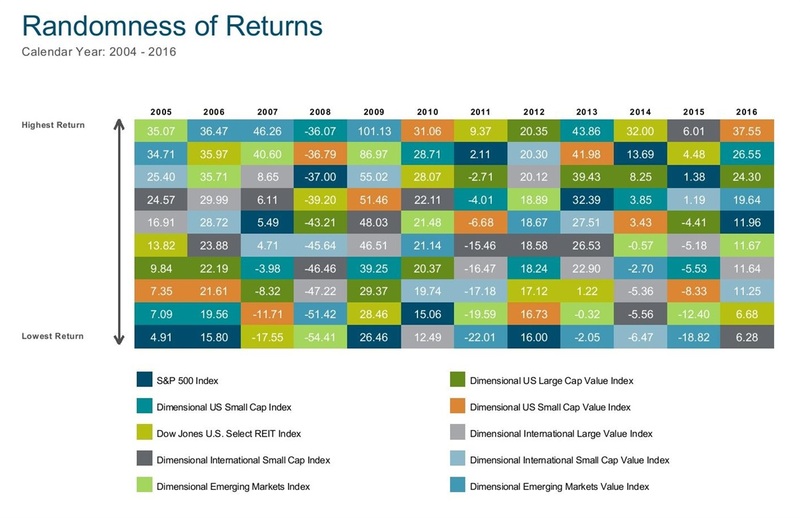 And because all "core" asset classes are expected to have decent long-term returns, this should be more than sufficient to achieve your long-term goals.